Twinlab Apple Pectin USP Caps are of the highest quality and meet the purest grade of apple pectin obtainable. 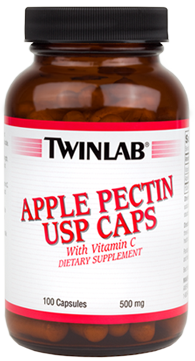 Twinlab Apple Pectin USP Caps also contain vitamin C. Vitamin C is believed to enhance the effectiveness and benefits of apple pectin. Well tolerated by most individuals. No tablet binders, coatings or colorings added. Take one capsule one to three times daily with a meal or as directed by a health care professional.